Let me make my disclaimer: I’ve never seen Doctor Who, the British sci-fi show that has been playing on the BBC since shortly before the dawn of time. 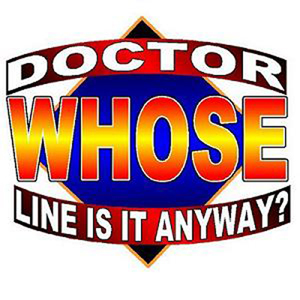 And so I had to be caught up, just a little, on the trappings of the improv show called Doctor WHOse Line Is It Anyway? — all this talk of the Master and the Adjunct Professor and the Dalek that keeps showing up at the Fringe beer tent. But it doesn’t much matter if you don’t know Doctor Who — or at least it didn’t at the performance I saw, where half a dozen or so Orlando improvisers made very little of their material or the setting (Istanbul) they solicited from the audience. Maybe it should have been an omen that nobody onstage seemed to know that Istanbul is a city, not a country. Still, one of the cast members (there’s no program) does a hell of a camel impersonation, and he and a blond woman improviser — playing the Master and the Adjunct Professor — worked pretty hard to get the story moving along. But way too much of this 30-minute show was lifeless, with too much explanation, not enough action and too many of the improvisers just standing around. Maybe this was an off night. But you have to worry when the light show provided by venue tech Darth Knapik — who dimmed the house lights to reveal the twinkling stars in this former planetarium — gets the biggest ooohs and ahhhs of the night. Saturday May 28, 5:20 p.m.
Sunday May 29, 1:40 p.m.
Well, to be fair, Darth is pretty amazing.